I must of got a bad egg out of the bunch, major manufacturer error on song three side A. High chirping/squeaking noise throughout that song (grooves must of been pressed bad) and it was pressed off center. I tested other records I own and do not have that issue so it isn't my turntable belt. I'm gonna stay away from this pressing and look out for a original. The Smiths represent an era or a time when things were felt with great wonder and excitement. It was also the last band that really expressed themselves through their design of album and 12" single covers. Each one was an entrance to a world that seemed gay or at the very least, a portrait of an artist who railed against the system or machine, and either played the price of becoming obscure or a footnote to a series of sad moments. The Smiths became the voice for those who felt differently or couldn't fit in the world that was clearly made for other people. There is no such thing as a bad Smiths record, but for me, it is their compilations that speak loudly to me. The Smiths were one of the last bands to make the 45 rpm single separate from the album. Albums were important, but I suspect that The Smiths true aesthetic was the A-Side and the additional B-Side. 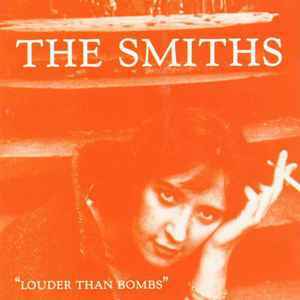 "Louder Than Bombs" is a compilation of their singles, and none (as far as I know, and being a lazy sod, I'm not looking this up as I write this essay) ever made it on to an official Smiths album. My favorite songs of theirs tend to be the singles and b-sides. The Smiths were brilliant in releasing incredible B-Sides, which traditionally were throw-a-way songs, and not meant to have any attention attached to them. But, all of us vinyl lunatics know that is not necessarily true, and The Smiths had brilliant songs placed in the obscure position of being forgotten. Or not, because The Smiths has paid attention to these 7" little wonders by releasing "Louder Than Bombs," which for the consumer, is a bargain, due to the cost of purchasing 45 rpm imported singles. Then, we didn't watch the footsteps leading to a horror show that we now have on hand. Who would have known? So in that sense, The Smiths are a band that very much wears the past as a shield, even in its original time of release, but now, it seems that this world didn't exist, or did it? Sounds muddy, too much mids. Has tracking problems on some songs also and I have a rega p5 so its not my table. Pitty, I was excited about this one. It seems like my copy (which I got new from Amazon) has some pressing issues. It's weird to describe, but some tracks do not seem to be as 'deep' as others. For example, "Panic" sounds really bad. anyone else notice a weird pressing error on "hand in glove"? Anyone know who cut this version of Louder than Bombs? 2564665877 not the best sounding release. Packaging is OK. I would like to find a better pressing. I had a bad experience with this pressing. My copy came with scratches and marks, some worse than others, but the sound itself was distorted and the record was slightly off center. I'm quite positive this pressing uses the exact same master as the 2011 Digital Remaster, which is junk. At least the packaging is nice, but it's overpriced too.